Reprint 1975, Dover Publications, Inc.
"These 100 folksongs were all collected . . . from actual singers all across Britain. 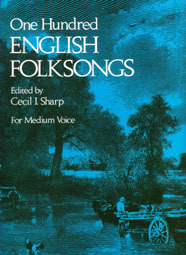 The tunes are presented precisely as they were originally taken down from the lips of the singers, and the lyrics are the best, most intelligible versions of the actual words and variants. . .The editor has provided a general introduction to the field of English folksong and substantial notes on all of the songs, citing related versions, historical allusions, etc." - from the back cover. The arrangements of these songs were first published in 1916 and the songs, music, lyrics, and arrangements should be in the public domain in the United States. PUBLIC DOMAIN STATUS: This Dover edition, first published in 1975, is an unabridged and unaltered replication of the work originally published by the Oliver Ditson Company, Boston, in 1916, in the series 'The Musicians Library". The arrangements of these songs were first published in 1916 and the songs, music, lyrics, and arrangements are believed to be in the public domain in the United States.